MAKING THE REVOLUTION presents an expansive collection of primary sources to enhance classroom study of the American Revolutionary period from 1763 to 1791 (the end of the French and Indian War to the adoption of the Constitution and the Bill of Rights). Many of the resources have not been available before in an open collection for classroom use. HOME PAGE BANNER: Amos Doolittle, A View of the South Part of Lexington, 1775 (detail), print #4 of series Battles of Lexington and Concord, colored etchings/engravings, 1775. Courtesy of the New York Public Library, Digital ID 54390. 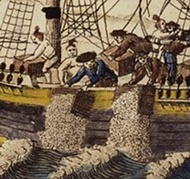 CRISIS: Americans Throwing the Cargoes of the Tea Ships into the River, at Boston, engraving (detail), in W. D. Rev. 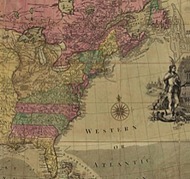 Mr. Cooper, The History of North America (London: E. Newbery, 1789). Library of Congress, Prints & Photographs Division, LC-USZC4-538 (also Rare Book and Special Collections Division, Digital ID us0012_01). Courtesy of the Library of Congress. 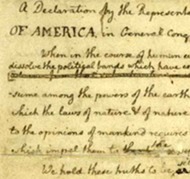 REBELLION: Thomas Jefferson, manuscript draft of the Declaration of Independence, June 1776, p. 1 (detail). Courtesy of the Library of Congress, Manuscript Division. 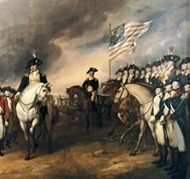 WAR: John Trumbull, Surrender of Lord Cornwallis, oil on canvas, 1820 (detail). Courtesy of the U.S. Capitol, Office of the Architect of the Capitol. INDEPENDENCE: Carington Bowles, Bowles's new map of North America and the West Indies, exhibiting the British Empire therein with the limits and boundaries of the United States as also the dominions possessed in that quarter, by the Spaniards, the French & other European states, the whole compiled from the best surveys and authentic memoirs which have appeared to the present year, 1783 (detail), London, 1783. Library of Congress, Geography & Map Division, Call No. G3300 1783 .B6 Vault. Courtesy of the Library of Congress. 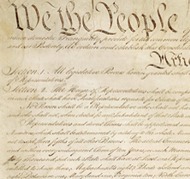 CONSTITUTION: Constitution of the United States, signed copy, 1787, p. 1 (detail). U.S. National Archives, Miscellaneous Papers of the Continental Congress, 1774-1789; Records of the Continental and Confederation Congresses and the Constitutional Convention, 1774-1789, Record Group 360. Courtesy of the U.S. National Archives and Records Administration.